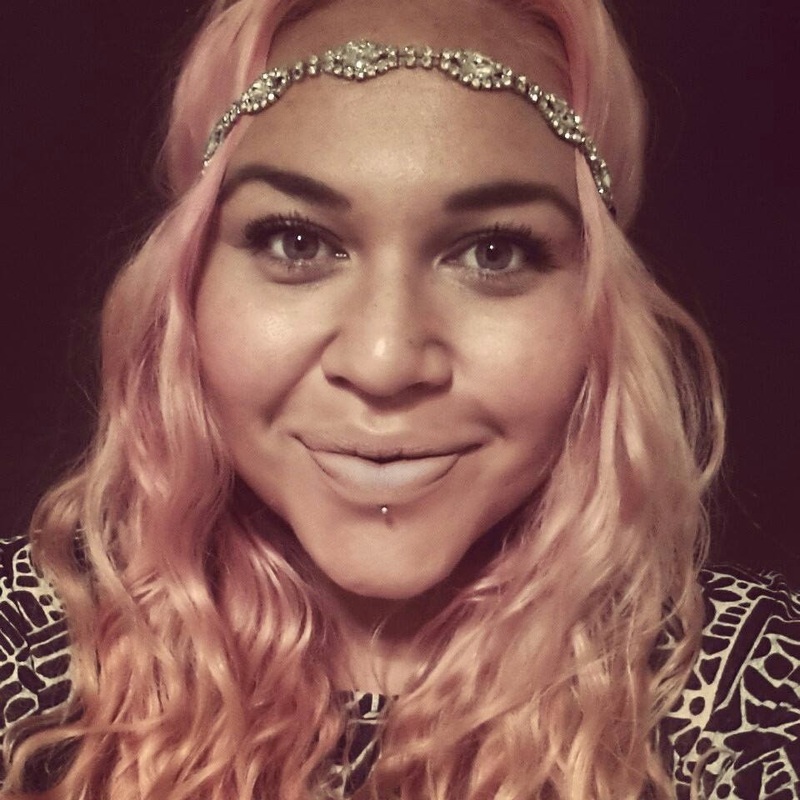 he called her Siki-Lou: Aussie Curves: Mixing Patterns! Yay! What a fun week! I love mixing patterns...sometimes extremely with one big bold pattern against another which has those who don't understand saying "are you really going to wear that?" to me LOL. and other times where the patterns are quite low key and blend quietly together! 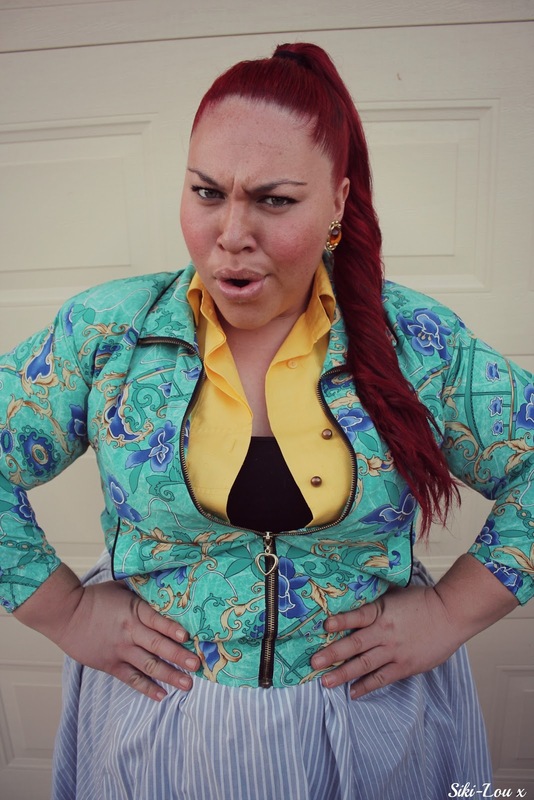 This week I teamed this fabulous patterned crop jacket I found in a Brooklyn thrift store (that was the MUMMA of all thrift stores, THREE levels of goodness!) 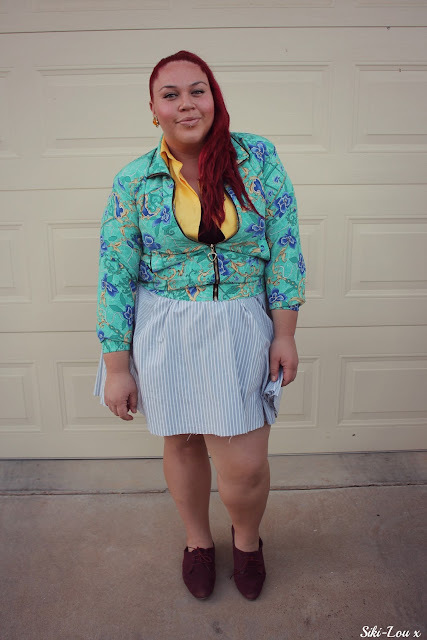 with a striped circle skirt. I added the yellow inside shirt for a bit of pop! 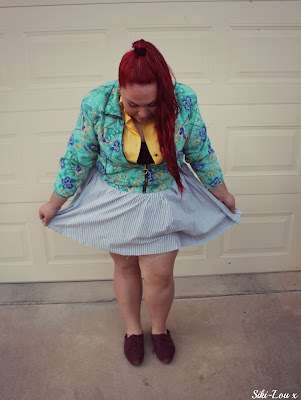 The outfit has a bit of a 50's look to so up went my hair in a high pony tail! That jacket omg! it is awesome, love this whole outfit particularly the colours! your awesome! Duuuuuuude! You're killing me here. That jacket is awesome personified and it was SIX BUCKS!!! Are you kidding me. Haha. You look amazing. Love this. hahaha...duuuuuude!! THANK YOU!! :) I could believe my eyes either when I actually found such a jem on the racks and then nearly fell over when I saw the price tag!! lol. Girl you're mixing it with confidence & style. Looks great. 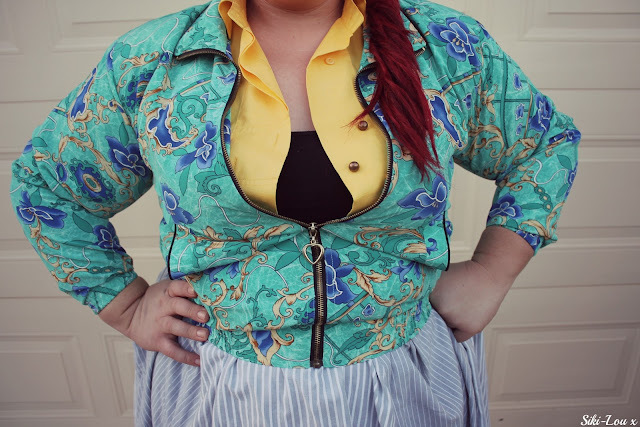 I love the print on the jacket and the yellow sets it off really beautifully, what an awesome find! Hiiii Omega!! Yeah I hadn't planned to wear the yellow but it was on my bed when I was getting dressed & I just thought...hmmm yep gonna put that on too and it worked!! :) lol. That jacket is amazing!! Can't wait to check out some U.S thrift stores to see what goodies i find hehe. sister....you're so fly. Can I borrow your jacket now that the world has seen it??? Lol I have been eyeing if off forever!! 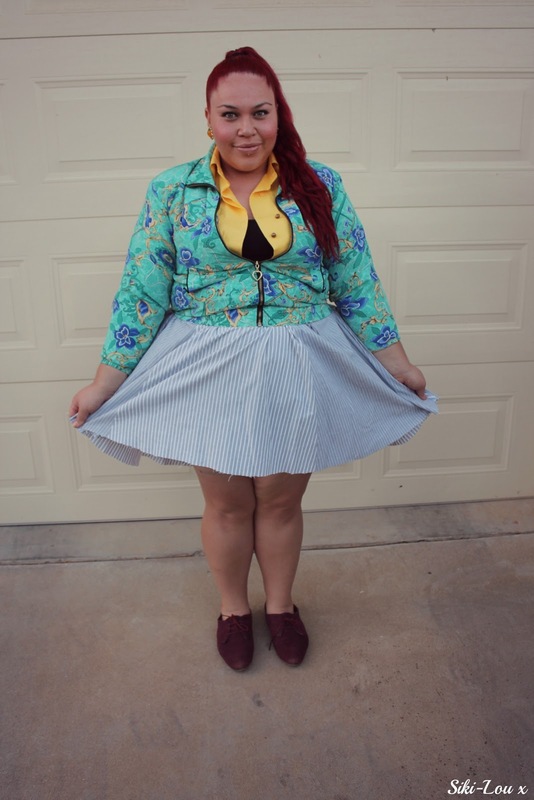 OMG OMG OMG I want that skirt!!! Argh that jacket is amazing!! It looks so good with the yellow!